“Shall I stir-fry?” says my husband’s note to me while I’m on the phone with my East Coast sister around our West Coast dinnertime. I nod enthusiastically and give the thumbs-up sign. Who could turn down such an offer from the humble king of stir-frying? In addition to the purple carrots, broccoli, mei qing choi and green garlic from our CSA farm share, he used some frozen packaged shitake mushrooms approaching their expiration date. Purple carrots, we found out, are rather problematic in soups as they turn the broth and light-colored ingredients (like shrimp) blackish. Adding lemon juice changed the broth to an interesting purple color, but the purplish-greyish shrimp did not look appetizing. However, the carrots behaved themselves better in the stir-fry, as they were fried quickly and with little liquid. Substitutions: you could use orange or yellow carrots, or substitute bok choy or other Chinese green for the mei qing choi. As always, stir-frying is most successful when a few stir-fry rules from my previous post are followed. Most important: chop all veggies to equal thickness, dry off all ingredients before stir-frying, and prepare all veggies and sauce before you start cooking. 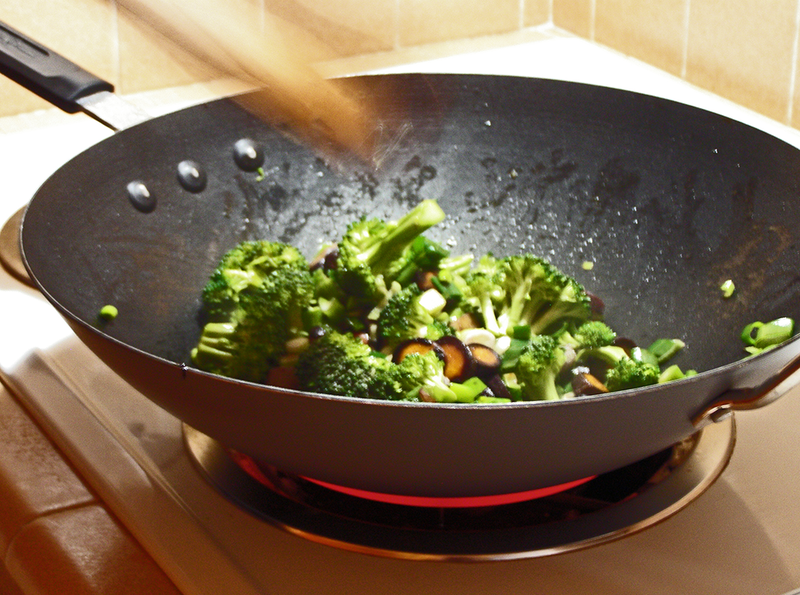 Also, remove stir-fry from wok to serving dish promptly after cooking, so it doesn't overcook in the hot wok. Slice carrots into 3/8-inch pieces. Separate broccoli stems from florets, and chop stems into 3/8-inch pieces. Dry off carrots and broccoli stems with kitchen towel and put into a container (bin #1). Cut or break broccoli florets into approximately 1-inch pieces. Slice scallions and green garlic into 3/8" pieces. Dry off broccoli florets, scallions, garlic, and mei qing choi, and put into second container (bin #2). Slice mei qing choi into 3/8-inch strips, cutting across the stalk and leaf. Dry off with kitchen towel and put into third container (bin #3). Drain shitake mushrooms thoroughly, and dry as much as possible, pressing the slices with a folded paper towel. These will stain your kitchen towels, so it's better to use a disposable product. Put these in a fourth container (bin #4). Whisk together rice vinegar, soy sauce, sesame oil, hoisin sauce, and plum sauce in a small dish. 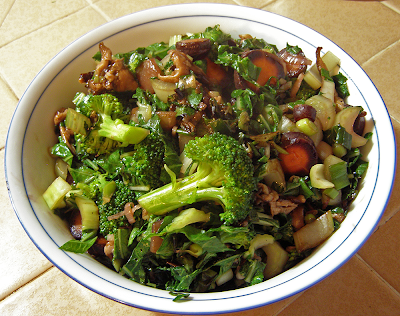 Add contents of bin #2 (broccoli florets, onions & garlic) to wok. Stir-fry for 1 minute. Add contents of bin #3 (mei qing choi) to wok. Stir-fry 30 seconds. Add contents of bin #4 (mushrooms) and sauce to wok. Stir-fry 30 seconds. Remove from wok to serving dish immediately.